Since the temperature has been almost spring-like here in Middle Tennessee, the birds have been a lot more chirpy lately. Yesterday, my cat was on the deck mesmerized by the bird activity in a nearby tree. I have to admit I like watching them with her sometimes, as long as it is not a mockingbird. I love all birds, but after being tortured every morning at dawn during my freshman year of college by a particularly evil mockingbird (I felt very much like Zooey Deschanel's character in Failure to Launch), I loathe them. However, I am fascinated by how organized and crafted bird nests are. Being a Chi Omega, I especially love owls and their popularity right now! As I was looking around my very blah desk at work the other day, I thought my little space needed some oomph. 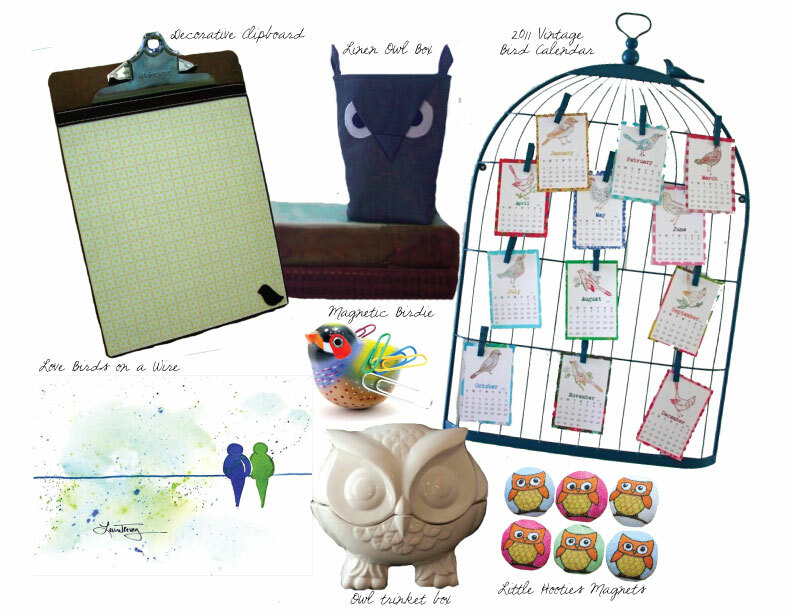 With spring only 26 days away, what would be a better desk organizing theme than birds? Etsy, as usual, always has a treasure trove of great finds. Clockwise from top left: this adorable decorative clipboard is perfect for organizing bills, to-do lists, inspirations, etc. in a stylish way. The linen owl box can hold all the little odds and ends that congregate on desktops. If you're going to have junk, at least keep it together in a cute little owl! I LOVE this 2011 Vintage Bird Calendar and the way it is displayed on this birdcage board. The best part is, you can print it from your own computer so you don't even have to pay shipping or wait for it to get to you. If you have a magnetic note board, these Little Hooties magnets can hold up your most urgent of notes and be cute doing it. I think little white trinket boxes in just about any shape looks so clean atop a stack of books or next to a vase of fresh flowers. This little Owl Trinket Box was made from a 1970s mold so he's a mix of old and new! He would be a great rubber band holder because those things can get unruly, especially if you have curious kitties around who would want to play with them. For other pesky small items like paperclips, this Magnetic Birdie does the trick of keeping them all together while making the birdie look pretty and feathery at the same time. Last but not least, Laura Trevey has a new gorgeous watercolor of Love Birds on a Wire. This is a cool color palette but she also has a warm color palette and can customize to your specific colors if you so desire. While this is not an organizer of any sort, it's beautiful and would be the perfect finishing touch to your desk space, completing the bird theme and adding a pop of bold color.